On the morning of April 9, while General Robert E. Lee realized that the retreat of his beleaguered army had finally been halted, U. S. Grant was riding toward Appomattox Court House where Union Cavalry, followed by infantry from the V, XXIV, and XXV Corps had blocked the Confederate path. Lee had sent a letter to Grant requesting a meeting to discuss his army's surrender and this letter overtook Grant and his party just before noon about four miles west of Walker's Church (present-day Hixburg). Grant, who had been suffering from a severe headache, later remembered that upon reading Lee's letter the pain in his head had disappeared. He stopped to prepare his reply to Lee, writing that he would push to the front to meet him. Lee arrived at the McLean house about one o'clock and took a seat in the parlor. A half hour later, the sound of horses on the stage road signaled the approach of General Grant. Entering the house, Grant greeted Lee in the center of the room. The generals presented a contrasting appearance; Lee in a new uniform and Grant in his mud-spattered field uniform. Grant, who remembered meeting Lee once during the Mexican War, asked the Confederate general if he recalled their meeting. Lee replied that he did, and the two conversed in a very cordial manner, for approximately 25 minutes. The subject had not yet gotten around to surrender until finally, Lee, feeling the anguish of defeat, brought Grant's attention to it. Grant, who later confessed to being embarrassed at having to ask for the surrender from Lee, said simply that the terms would be just as he had outlined them in a previous letter. The terms would parole officers and enlisted men but required that all Confederate military equipment be relinquished. The discussion between the generals then drifted into the prospects for peace, but Lee, once again taking the lead, asked Grant to put his terms in writing. When Grant finished, he handed the terms to his former adversary, and Lee -- first donning spectacles used for reading-- quietly looked them over. When he finished reading, the bespectacled Lee looked up at Grant and remarked "This will have a very happy effect on my army." Lee asked if the terms allowed his men to keep their horses, for in the Confederate army, men owned their mounts . Lee explained that his men would need these animals to farm once they returned to civilian life. Grant responded that he would not change the terms as written (which had no provisions allowing private soldiers to keep their mounts) but would order his officers to allow any Confederate claiming a horse or a mule to keep it. General Lee agreed that this concession would go a long way toward promoting healing. Grant's generosity extended further. 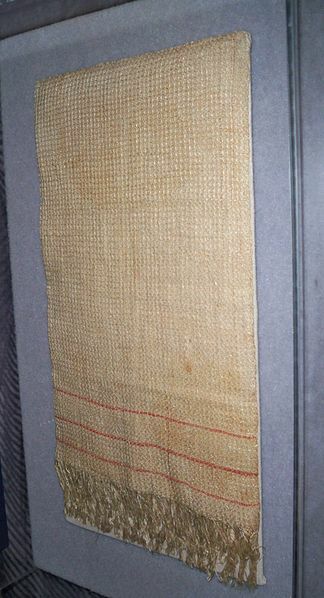 When Lee mentioned that his men had been without rations for several days, the Union commander arranged for 25, 000 rations to be sent to the hungry Confederates. After formal copies of the surrender terms and Lee's acceptance had been drafted and exchanged, the meeting ended. Before he met with General Grant, one of Lee's officers (General E. Porter Alexander) had suggested fighting a guerrilla war, but Lee had rejected the idea. It would only cause more pain and suffering for a cause that was lost. 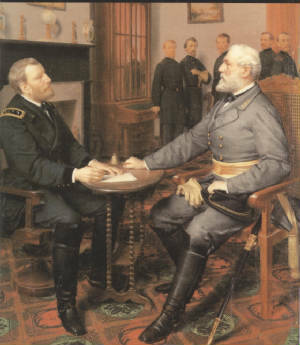 The character of both Lee and Grant was of such a high order that the surrender of the Army of Northern Virginia has been referred to as "The Gentlemen's Agreement." Sources: National Park Service; Appomattox Court House National Historic Park.